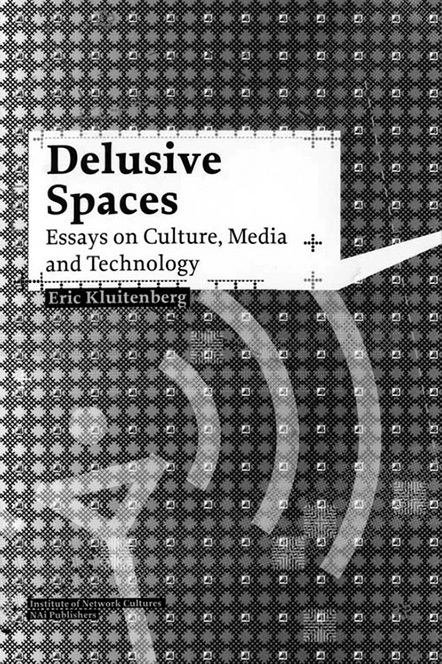 Delusive Spaces contains over 350 pages of articles by Eric Kluitenberg, written from 1994 to 2006. It is an impressive quantity of text, certainly when you consider that in a certain sense it is the by-product of more than ten years of work as an organizer, editor and teacher. Kluitenberg taught at one the first media programmes in the Netherlands (Media-GN in Groningen) and has since been a tireless organizer of events, debates and festivals in the field of media culture, initially often in Eastern Europe and now for several years at De Balie in Amsterdam. In this capacity he combines cultural, technological and sociopolitical themes. It is good that there is now a book that provides insight into the motivations of someone who, with his organizational efforts, is involved in shaping the debate in the Netherlands. It reveals his theoretical basis, it provides backgrounds and it also reveals his personal interests. The texts in Delusive Spaces – which refers to the misleading spaces of the media – come from three ‘sources’, or, as Kluitenberg himself calls them, three analytical trajectories. First there are fairly long, historically tinged texts that form the ‘Archaeologies of the Machine’ chapter, in which, for instance, the way civilization was transformed by the establishment of clock time-keeping. In an extension of this, there is speculative media archeology, which examines the dreams new media lead to. There are remarkably frequent references to American technology historian Lewis Mumford, who provides Kluitenberg with a technological philosophy that considers the cultural, the historic and the technological in connection with one another. The second part consists mainly of articles with a sociopolitical focus. They concern sociopolitical developments associated with the rise of the Internet and are mostly written in the context of one of the net culture events in which Kluitenberg has taken part. They analyse the new situation, call for activism, provide an outline of new forms of politics, identify the problems this produces or extrapolate and make a more controversial proposal. Here, for instance, we find the article about the ‘post-governmental condition’ that he wrote on the occasion of the last ‘Next5Minutes’ conference, but also his explanations of hybrid space and the right ‘not to be connected’ – part of Open no. 11, for which Kluitenberg served as guest editor. Finally there are several essays that, according to Kluitenberg, concern ‘the presence of the unrepresentable as an experiential rift in contemporary culture and society’ (page 33). The unrepresentable here is a reference to Lyotard’s philosophy of the sublime. Of all the philosophers and theorists examined in Delusive Spaces, Lyotard seems to be the one that occupies Kluitenberg the longest. Through Lyotard he attempts to make clear that a place has to be ‘outside’ – ‘outside the media’, ‘outside the system’ – in order for criticism to be possible. What connects the articles is that they consistently consider culture and technology, society and media, in connection with one another: technology is not just about ‘the calculable and predictable’ (page 69). In the introduction – the most recent text – Kluitenberg argues that theorists have to open the black box of technology. He emphasizes the necessity of hardware and software studies – a plea with which I whole-heartedly concur. In practice, in the older articles, he is still mostly opening the cultural black box: in the technocultural and the cultural-technological it is always culture that gets the attention. A second thread is the emphasis on the link between the digital media space and non-digital reality. For this he develops the concept of hybrid space, which combines the flow of spaces or the space of flows. This is why he insists on an activist use of new media that is not limited to cyberspace. The texts offer a retrospective of the evolution of the ‘media discourse’ over the last ten years. From the pre-World Wide Web days to the activist age of tactical media (when the Internet seemed to be turning into an alternative space to ‘the media’), to the current culture of always-having-to-be-connected and its dark side: the total data mining and continuous real-time tracking of data bodies and products as well as human bodies. In this regard Delusive Spaces also traces the transition from mass-media spectacle society in which power can be exercised through visibility in the media to a society in which everything is de facto visible and traceable. In this world, says Kluitenberg, ‘Power is vested ... not in the ability to connect and become visible, but in the ability to disconnect, to become invisible and untraceable, at will.’ (page 287) This is why Kluitenberg asserts that we have to defend the right not to be connected: as a form of resistance, in order to create a place from which criticism is possible. While Kluitenberg’s concept of hybrid space is probably the most interesting, the right not to be connected provides the most food for thought. Yet I still find his article ‘Media Without an Audience’ the most appealing. It relies heavily on a long quotation from Adilkno’s theory of sovereign media, and it owes its method to Adilkno as well. When it was written in 2000, it made an issue of an avant-garde idea; it has since become an uncanny description of a media reality, in which everyone is a broadcaster and, if you’re lucky, only a few friends are still tuned in. Messages are no longer being sent out into the world; there is only an attempt to make contact. Or, as he says himself in ‘The Pleasure of the Medium’, ‘Self-mediation does not aim at communicating – at conveying a message – instead it tries to establish affective relationships.’ (page 283) He views this as an anthropological principle: it is an attempt to feel at home in an environment that is not naturally ours. It is passages like these, in which Kluitenberg encapsulates the apparent paradoxes of our media society in words, that make this collection worthwhile. The fact that the book also contains a lot of familiar work, perhaps too many summations of other people’s insights, and that as whole it is uneven, is something you’re happy to forgive.